« Meadowlands Rail Station coming along but when will it be done? 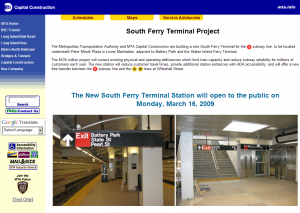 The MTA Capital Construction website has finally announced the opening of the new South Ferry Subway Terminal Station. No time is given, but various sources are reporting midnight, 10:00 AM, or noon. This entry was posted on Thursday, March 12th, 2009 at 2:11 pm	and is filed under delays, railfanning, subway. You can follow any responses to this entry through the RSS 2.0 feed. You can leave a response, or trackback from your own site. Probably will open before the AM rush to accomodate the SI passengers coming in. So far as a PR campaign, the Mayor et. al. will probably ride in to the new station early in the AM like they did when the tracks for the Williamsburgh Bridge were redone in 1999. There will be a ceremony in the morning. Revenue service should start at noon.